Your "Cyber Angel" Ritual Monsters cannot be destroyed by battle. 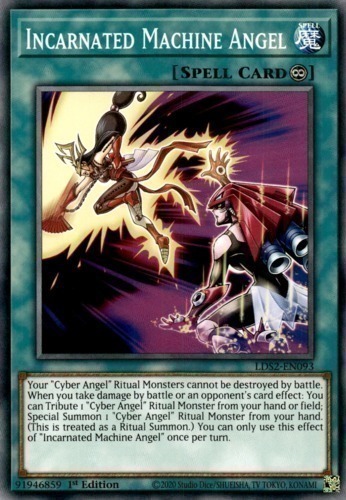 When you take damage by battle or an opponent's card effect: You can Tribute 1 "Cyber Angel" Ritual Monster from your hand or field; Special Summon 1 "Cyber Angel" Ritual Monster from your hand. (This is treated as a Ritual Summon.) You can only use this effect of "Incarnated Machine Angel" once per turn.